The Japanese financial markets are beginning to get exciting. I have discussed many times over the last 18 months that the announcement of the ECB to do "whatever it takes" marked the entry into the second phase of the sovereign debt crisis. During this phase of the crisis, you will see the perverse economic consequences for what has now become gospel for economic recovery: unlimited government spending combined with unlimited central bank printing. It is now widely believed that the only mistake policy makers can make is not doing enough of either one. During these many discussions on this second phase of the sovereign debt crisis I mentioned that I believed Japan would be the first country to implode. It could just as easily begin in Europe, the United States, or the U.K. (and it will eventually arrive at all three), but for countless reasons discussed Japan is simply a powder keg waiting for a match. The match was lit upon the announcement of their most recent quantitative easing program discussed in detail here: Japan Steps Into The Abyss: Begins The Largest Money Printing Experiment In History. Now it is just a question of how long the fuse will burn before it ignites. 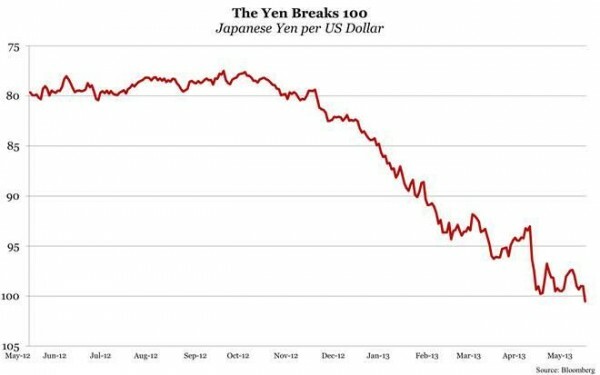 Back in late 2012, when it became clear that the new leadership at the Bank of Japan (their version of the Federal Reserve) would do "whatever it takes" to take the lead in the currency war, meaning devalue their currency through money printing, the Japanese Yen has been in a straight line decline. It crossed below the 100 mark against the US dollar this past week. The central bank has the ability to control the price of the Japanese government bonds, due to their ability to print enough money to purchase every bond in existence. However, if the markets chose to protect themselves against the promised currency devaluation it is impossible for them to simultaneously keep control of the value of the yen and protect the yields on bonds. At some point they are going to lose control of one. It is likely that they will eventually lose control of both markets simultaneously as more and more investors in Japan and around the world begin to understand what is taking place. An interesting thing began to happen in the long term Japanese bond market 4 days ago, which people have said for years now would never occur. The following chart shows the incredible move in 10 year government bond yields from the 60 basis point range to the 90 basis point range in only a few short days. Bond prices move down as yields move up. The central bank is currently purchasing over 70 percent of all government bond issuance, which makes the current move even more incredible. If yields keep moving higher, they will be forced to buy more. They cannot allow yields to rise because the cost to finance the debt would instantly overwhelm the entire government annual tax receipts. Is this the moment that the central bank finally loses control? My question is not whether to short the yen but which base currency to pair it against? Currently I am deciding between shorting the yen against one of these three: NZD, SGD or USD. My timeframe is longterm (years). USD will have its day of reckoning but will probably go strong through the initial stages of Japan's currency crisis. Singapore is a great and growing economy but they do have a decent government debtload so once investors realize that high debt levels are a problem everyone might be cautious of any country h=with higher levels of debt. New Zealand is pretty small but as a very small debt to GDP, a central bank not hellbent on destroying the currency and is ranked as on of the easiest places on earth to do business. I am leaning towards NZD/JPY. What would you choose if you were playing Japan's crisis via forex? Or, if not forex then what? I like the NZD best, SGD second, & USD third, for all the reasons you just mentioned. Make sure your time frame is long term and you can handle pull backs. While I believe it is ultimately going much lower, the JPY has had a tremendous fall over the last few months and many market participants are now short. Thanks for the comment.